Early surfing in New Zealand was fairly DIY with logs, canoes and bags of kelp providing a base for riding the country’s waves. In the 19th century European missionaries are said to have discouraged the somewhat revealing sport, but thankfully surfing was revived with the 1915 visit and demos of Hawaiian surfing legend, Duke Kahanamoku. The endless coastline of New Zealand meant surf life saving and surfing went hand and hand, and surfing in New Zealand continued to grow with Californian and Australian influences across the small country. What’s the surf like in New Zealand? New Zealand is made up of two main islands – the North and the South island, which are separated by the Cook Strait and positioned in the south east of the vast Pacific Ocean. The long, narrow geography of New Zealand means finding waves to suit all levels is an easy task. With over 15,000 kms of coastline and a variety of beach, reef and point breaks, you can bounce from east coast to west coast finding the best New Zealand surf camps, the wave to best suit you, and often with little competition from other surfers. Choose the north island for boardies and sub-tropical temperatures or the south island for sub-Antarctic neoprene needed waves. The tip of the North Island enjoys warm weather year round but particularly in summer from December – April. Start at Shipwreck Bay, the longest left hand point break in New Zealand. A sheltered reef break with strong rips, this is more a spot for the advanced surfer. Drive your rental car right on and along the long stretch of nearby ninety-mile beach for a beginner beach break and uncrowded lineups. If you miss out on catching the big one, check out the gigantic sand dunes of small town Ahipara and surf the sands. The west coast of the North Island is home to some of the country’s most famous surf breaks. Raglan lies just 2 hours south of the country's largest city, Auckland, where you'll most likely start your surfing holiday New Zealand; and has 3 world-class left hand point breaks and 2 beach breaks. The glassy reef breaks at Manu Bay and Whale Bay peel over volcanic reef and boulders for long rides and the occasional run in with Orca. With a population of just over 2500, Raglan is a great spot for sampling local organic produce, friendly cafes and live music when you want to wind down from surfing. Piha, the backdrop for popular TV programme, Piha Rescue, is another well-known west coast surf spot. Less than an hour from Auckland, Piha is a solid beach break with strong rips, and is regarded as one of the country’s top surf beaches. The majestic Lion Rock separates South Piha from North Piha and provides a stunning backdrop to a day in the surf. A good left hander off nearby Camel Rock with left and rights by Lion Rock mean this beach can be a crowded option in the height of summer. Get there early and don’t forget your flip flops, the black sand gets scorching in the afternoon sun. When you get hungry, some of the best hot chips can be found at South Piha’s, Blair's on the Beach. Rivals Raglan for the title of New Zealand's surfing mecca, the beach at Whangamata is a great New Zealand beginners surf beach, and also home to one of the country best beach breaks - the world-class Whangamata Bar. The area is an adventure paradise with miles of white sandy beaches and then just a short distance inland you have hiking and biking trails in the Coromandel Forest Park. There is a great buzz in the summer (November -February). Mount Maunganui or "The Mount" as it is known to most Kiwis, is a popular sandy beach for surfers and beach goers in the warmer summer months with peaks the length of the beach. Further down the coast, Papamoa offers a much less crowded option. Get up early for a walk up the town’s namesake, soak in the local hot pools and experience café culture and local designer shops. Claimed by many as the first city to see the sun rise each day, Gisbourne is surrounded by surf spots and home to many of the country’s best competitive surfers. Generally smaller and cleaner than surf on the west coast, waves on the East Cape still pack a punch. With a good choice of right handers to choose from, like Tolaga Bay, Gisbourne is a great spot for beginners. Sunny skies (a yearly average of 2,200 sunshine hours), orchards and vineyards are also attractions of the picturesque area. Fish will be on the menu too with Gizzy having some of the best fishing in the country, whether you head to the many rivers or out on a local fishing charter. 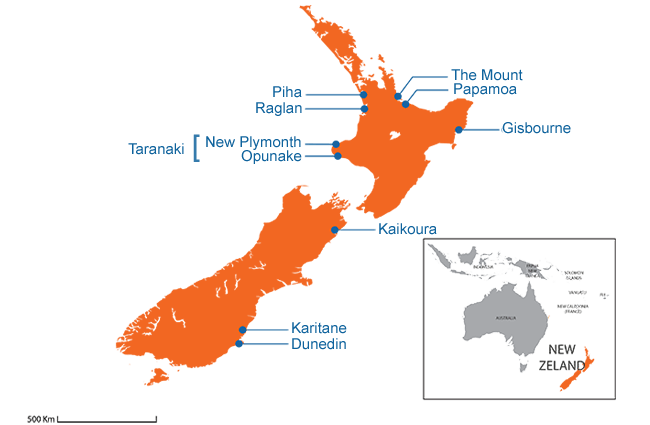 The Taranaki coast is made up of over 50 great reef breaks and point breaks which stretch around volcano, Mt. Taranaki. The rich volcanic soil is perfect for growing and the area is scattered with beautiful gardens, farms and Egmont National Park. The mountainous terrain and high peak was also used as the filming location for The Last Samurai as it had a Japanese feel. The area is Surf Highway 45 will take you from New Plymouth to Hawera to surf the 180 degrees of ocean swells the coast collects. Opunake beach is a must see which is good for beginners right through to experts offering left and right handers. Alpine fresh is sometimes how Southerners refer to the water temperature of the South island which often make for uncrowded lineups on the coasts of New Zealand’s larger island. You might need to share the waves with the odd seal, dolphin or shark though! Kaikoura is full of right hand point breaks, is famous for its waves, its abundance of fresh seafood and ocean wildlife in general. If you're not racing with seals in the waves, check out a swim with the seals/dolphins tour or enjoy a spot of whale watching along the coast. Ohau Stream is a particularly unique spot where you can see baby seals frolicking in a waterfall pool minutes from the roadside. Mostly working on low tide, expect a rocky entry to access most surf spots like Graveyards, Meatworks and Kahutara. Right point break Maungamaunu is a surf spot surrounded by the towering Kaikoura mountain ranges and easy to find right on the coast of State Highway 1. Wide open to southerly swells, Dunedin’s quality beaches consistently collect 1-3 metre swells with 4-6 metre swells common during the winter months. East and north swells from tropical cyclones also provide Dunedin’s north coast with similar swell sizes so you can guarantee there is generally always somewhere with offshore winds. Beach break St Clair is a popular spot with both right and left handers. Close by St Kilda is a long stretch of beach where you can avoid crowds and good from beginners right through to advanced. Aramoana is a beautiful spot to catch waves and watch albatross swooping to opposite side of the harbor. Brighton is a right hand point break located south of Dunedin. Nice peeling waves and good for all levels. Karitane Beach is a sandy beach good for all levels offering peaks right the way down the beach with left and right handers. Day trip around Dunedin’s many bays and inlets to visit the breeding colony of the Northern Royal Albatross then end the day in the pub, Dunedin’s a student town with great night life and a popular New Zealand surf holiday destination. Two islands mean two slightly different climates for surfing in New Zealand. With the far north island enjoying more subtropical weather during the summer. Summer temperatures range anywhere between 20-30°C on both islands.The inland alpine areas of the South Island can drop to -10°C in winter. The majority of the country lies close to the coast, resulting in mild temperatures. The average New Zealand temperature decreases as you venture south. January and February are the warmest months, and July is the coldest month of the year. On the North Island, enjoy the surf in boardies or a 2mm wet-suit in the summer: Dec-April. Winter runs from May to November where a 3mm wet-suit is ideal. Suit up for your the South Island. A 3 or 2mm wet-suit in the summer months and a 5 or 4mm wet-suit, booties, gloves and a hood in winter.